Trust Professional Safety Supply for reliable harnesses at great prices. Choose from Latchways, Miller, MSA and Titan safety harnesses and lanyards. Personal Rescue Devices and Rescue Poles offer enhanced protection. Discover improved strength and performance in fall protection that meets ANSI Z359-2007 Standards. Stock up today on the best in harness fall protection at Professional Safety Supply. Quality, comfort, and value come together in the Workman line of products. 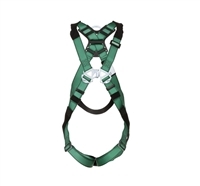 Workman Full Body Harnesses feature lightweight components and durable webbing. Professional Safety Supply is the place for workplace and industrial safety supplies.